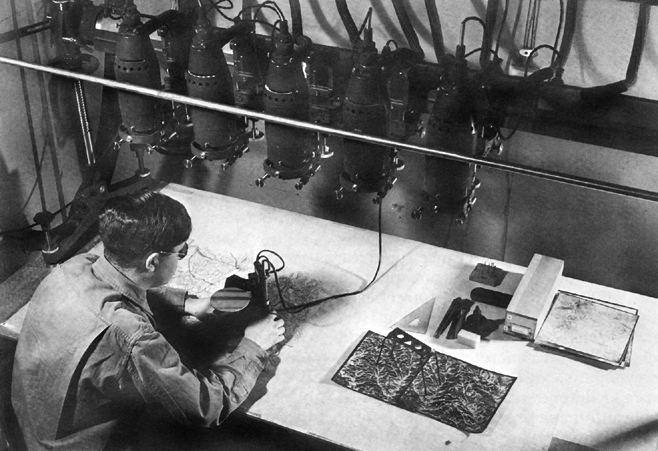 Detailed engineer planning for a Continental invasion continued in 1943 with the addition of a forecasting technique imposed upon theater planners by ASF headquarters in Washington. To involve theater staffs around the world in procurement planning for major operations Army Service Forces had devised a system of so-called operational or keyed projects. Theater planners were to compile lists of Class IV and Class II items (in excess of regular TOE and TBA allotments) and to key the requested items to specific and foreseeable tasks such as the reconstruction of an individual port. of other services who wanted quick estimates of engineer work. The estimates varied greatly in kind-from requirements for a mile of railroad track to complete details for building and equipping a 1,000-bed hospital. Even after more definite information on OVERLORD became available in July 1943, engineer planners were hampered�more than the other services�because the demand for the utmost secrecy deprived them of information on specific terrain. At the insistence of the chief engineer security was relaxed, and the details of OVERLORD were revealed in the late summer of 1943. Theoretically, planners could then study the specific ports, rail lines, and highways involved, but the need for long-range procurement action and for time to activate and train engineer units made only changing estimates possible. When planning for specific ports proved virtually impossible without knowledge of port conditions and facilities, the engineers turned to more generalized methods of construction planning. They first correlated the planning demands to a fixed length of quay. Then, taking the OVERLORD phased tonnage requirements for the invasion, they tied the phased capacity to the figures they had derived for the fixed pier length. One ton of cargo per linear foot of pier per day became the standard engineer planning yardstick for port reconstruction. These data were combined with others to produce master lists and general requirements requisitions for the Continent. French harbors had silted up during the enforced inactivity under German occupation, and it would take extensive dredging to clear them for the sort of supply operations envisioned in the invasion plan. The Germans were also likely to sink blockships and other obstacles in the harbor channels and alongside berthing areas: The engineers took into account the amounts of explosives or specialized equipment needed to remove the blockages. They also requested specially designed shallow-draft port repair ships, to remain under Army control, that would provide floating machine shops to maintain construction equipment in use or to make replacement parts for damaged lock gates and power plants. The engineers attempted to develop standard, repair methods and bills of materials for the lines of communications and supply leading out of the port areas. They tabulated the labor and material needed to repair a mile of railroad track or of oil or gasoline pipeline and to provide 1,000 square feet of general-purpose shop or depot space. There were some forty-one contingency plans for dealing with unpredictable Channel tides and weather, which could make repairs necessary under other than normal water levels. Realizing that ports would not be available for at least ninety days after the invasion, COSSAC allocated authority for beach operations among the Navy, the Army�s Transportation Corps, and the Corps of Engineers, which carried the heaviest load. At this stage the main problem in planning beach supply operations was selection. Beaches had to be wide and sheltered from high winds and heavy surf. 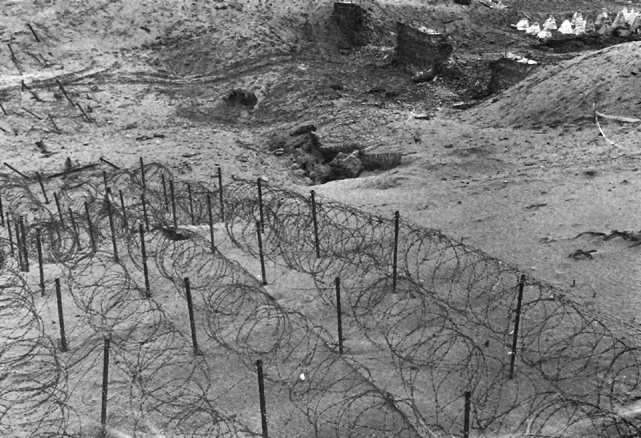 Terrain and beach outlets were of prime importance in the early days of the invasion, and the engineers tried to locate supply beaches near ports that would serve as supply arteries once beach operations closed down. Plans also included optimum sites for beach air strip construction, for inland movement and communication, for protection by Allied air power, and for limited enemy opposition. nets on the Continent would reach 75 percent. Since such an estimate called for staggering tonnages of railroad equipment, it was cut to 25 percent for main line tracks and to 35 to 50 percent for yards and sidings. US Army engineer and British planners provided the following revised estimates of expected damage: railroads in the port area, 75 percent; railroads up to thirty miles inland, 50 percent; those beyond that distance, 25 percent. Railway bridges in ports and up to thirty miles away would be damaged 100 percent; those beyond, 50 percent. In fact, the engineers overestimated the amount of new rail and wooden ties that would be needed in northern France. Though the destruction in major centers was severe, the trackage in open countryside escaped extensive damage, often more affected by Allied air attacks than enemy action, and cancellation orders stopped much of the continued movement of rails to Europe later in the year. Initial estimates on the consumption of gasoline in the ETO were indefinite; only late in the planning stage were engineer planners able to make fairly accurate calculations. Except for bulk storage installations, which were usually in the vicinity of ports, existing POL facilities generally lay underground and were not well suited to military needs. Pipelines had to be laid along existing roads to minimize the problems of transporting and distributing construction materials. The terrain along selected routes was an important factor, for it had a direct bearing on the number and spacing of pumping stations. The tactical plan and the location of large supply depots generally would determine both the location and capacity of bulk storage installations. Thus, with every major change in the tactical plan (or with any other material change in plans) a new pipeline distribution system had to be designed. minimum standards for civilian use and studied existing utilities systems and anticipated damage. The engineers set broad classifications to delineate conditions of employment and skill levels for workers. Two general categories aligned prospective employees by their willingness to work in mobile or static detachments. Static laborers usually worked in a single location, lived nearby, and were responsible for their own quarters and food. Mobile workers, who received their sustenance and housing from the Allied command employing them, usually performed as part of a transient labor company organized on military lines. Both static and mobile workers served under contract and were considered unskilled until they proved otherwise. Their wages would then change accordingly. First Army was to estimate the tonnage and supply needs from D-day to D plus 15 (Phase I) for all US forces, including air and naval forces in the assault, and have ETOUSA fill the requisitions. In Phase II, D plus 16 to D plus 40, 1st US Army Group was to compile the required tonnage figures but would have ETOUSA fill the requirements through ADSEC. FECOMZ was to arrange for the buildup to COMZ and to introduce base sections at the same time that 1st Army Group was strengthening the combat zone with additional armies. Between D plus 41 and D plus 90 (Phase III), 1st Army Group would continue to assemble the overall tonnage requirements, but they would be implemented through FECOMZ, which would assume active control when a second base section arrived on the Continent and ADSEC moved forward with the armies. Not until D plus 90 was COMZ to reach the Continent and take over from FECOMZ. Whereas First Army issued its plans in February 1944, the FECOMZ plan was not complete until 30 April 1944. The detail involved in some aspects of the planning was enormous, and the ADSEC engineer plan literally outweighed that of all the other technical services combined. Two thick volumes of data on the Normandy ports included an analysis of each port�s facilities, a schedule of reconstruction, and a catalogue of equipment and materials required. Planning for post-OVERLORD operations (D plus 90 to D plus 120) forced Moore, along with other technical service chiefs, to furnish an estimate�by month and class�of the tonnages he would need for the entire period from D plus 90 to D plus 360. Planning for this period continued under the PROCO system according to ETOUSA SOS Series H directives. 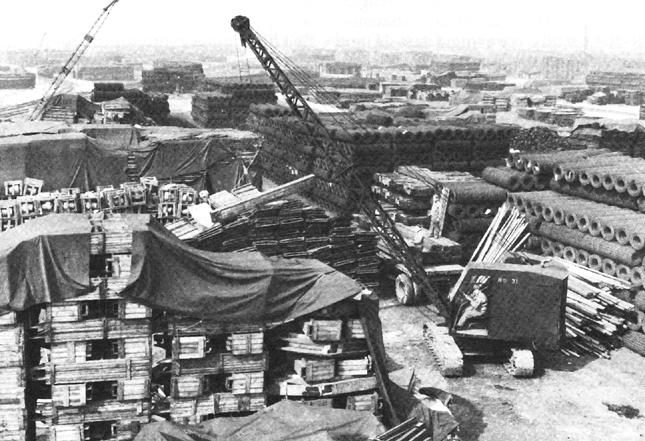 Two directives before D-day established progressive phase lines and troop counts to D plus 360 and required engineer statements on which material was to be stored in the United Kingdom and which would go directly to the Continent. 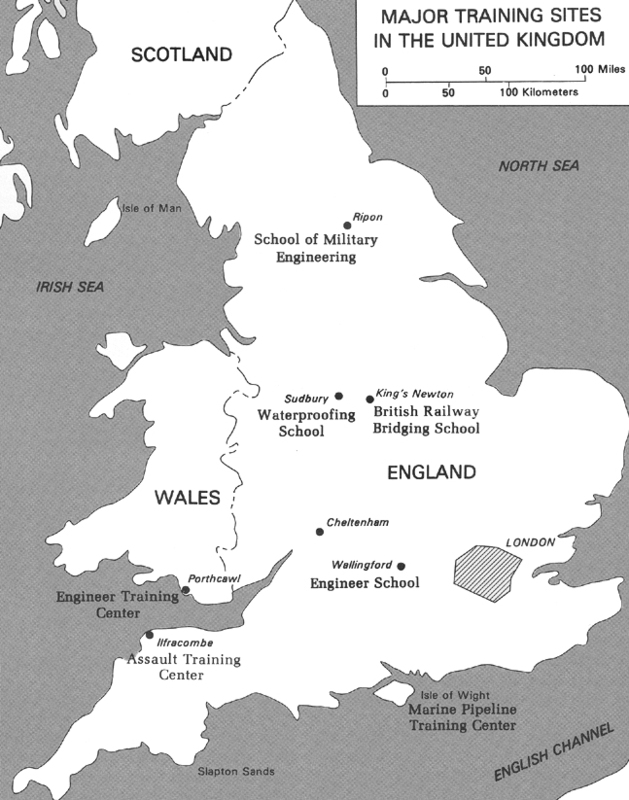 Training SOS engineers in the United Kingdom was the responsibility of Troops Division, OCE, ETOUSA, which had a London branch planning for future operations and a Cheltenham branch providing training aids to SOS troops and supervising SOS engineer schools. The base section supervised training. Theoretically one hour a day or one day a week was given over to training for future operations, but construction priorities often made it impossible to follow any training schedule. Troops might be working on day and night shifts, or bad weather would intervene and training would have to be canceled. In any case, the allotted one hour a day was of little use, for it often took that long to reach a training area. 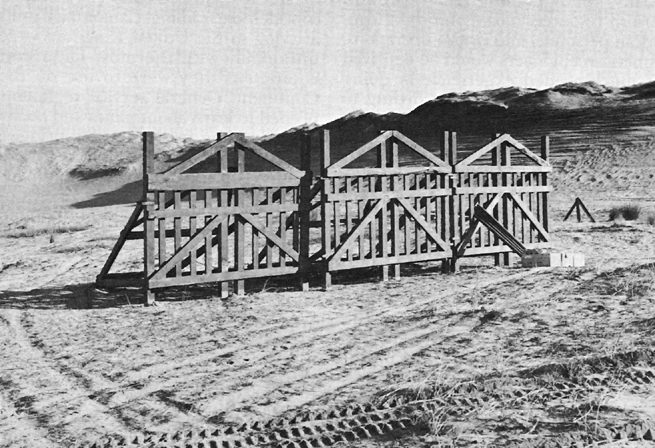 MODELS OF BELGIAN GATES, patterned after German obstacles on Normandy beaches. WIRE ENTANGLEMENTS AND DRAGON�S TEETH at the Assault Training Center, Woolacombe. ENGINEER MAPMAKER USES A MULTIPLEX to establish accurate contours on invasion maps. be proud of the maps they prepared jointly for operations on the Continent. In 1939 the British had had to start almost literally from scratch. Only for eastern France were World War I maps available on a scale as large as 1:25,000; few of them had been revised to show roads, bridges, or railroads built since that time or changes in fields and woods. For western France the only military maps were based on those Napoleon had used. They had been edited and enlarged to a scale of 1:50,000 but had not been made more accurate. Few maps had had any terrain corrections since 1900. In June 1943, General Moore, Col. Herbert Milwit, head of Moore�s intelligence division, and Maj. Gen. Ira C. Eaker, commanding officer of the Eighth Air Force, discussed the problem. General Eaker said he would help the engineers get more accurate photos. Beginning on 22 June 1943, the 13th Photo Squadron, using K17 cameras in F-4 and F-5 aircraft-reconnaissance versions of the P-38 Lightning-took wide-angle photographs covering more than 10,000 square miles without any loss from enemy action. The success of this project promoted greater Air Force-engineer cooperation, and there was no serious shortage of aerial photography during the invasion and for several months thereafter. In assuming responsibility for providing engineer intelligence as well as topographic service, General Moore was treading on new ground. No background of intelligence experience existed in the Corps of Engineers equivalent to that acquired in construction engineering on rivers and harbors duty. Few officers were competent to handle the expanded duties in engineer intelligence and topography, nor was any precedent available upon which to base an effective organization or plan. By agreement with a succession of theater G-2s, General Moore gave the Intelligence Division, OCE, ETOUSA, responsibility for all problems pertaining to the topographical service, including map policy, theater map library operation, and planning for map production, reproduction, supply, and distribution. In planning map production the Intelligence Division had to consider what map series should be completed, which maps the forces involved would need, how much time was available, and which cartographic and reproduction facilities could be used in the field. Planners soon realized that the required maps could not be produced with the available facilities in the time remaining. They decided to put first priority on 1:25,000 maps and photomaps of France north of the Loire and west of the longitude of Paris, with all new maps of the same design; second priority on 1:50,000 maps of the coastal regions in the invasion area; third priority on 1: 100,000 series covering the entire operational area; and fourth priority on a 1:200,000 road map. A more satisfactory 1:250,000 map suitable for both ground and air use was also required; the 1: 1,000,000 series needed considerable revision; and many town plans-several thousand sheets-had to be produced. drawn without revealing much about the general plan for any given area. On 1 September 1943, the British Directorate of Military Survey and General Moore�s Intelligence Division agreed to establish four special simnel depots, named for the code system applied to the map bundles. The depots, located at Aldershot, Oxford, Reading, and Towchester, had identical stocks, the code keys for the maps being kept by a minimum number of officers. 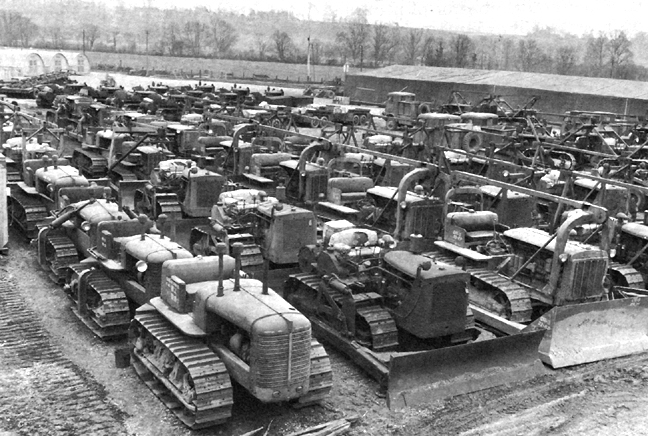 In late 1943, only the Oxford simnel depot had American personnel, but as the American invasion forces outnumbered the British in May 1944 the US Army took over a second facility at Lockerley. In mid-1943 as forces massed in the United Kingdom to prepare for the invasion of France, attention also turned to specific landing places for the assault force. The engineering problems associated with getting the troops across the mined and defended beaches were in themselves immense; organized and rapid supply movement across the same terrain was essential to the success of the operation. It was clear that engineers would be in plentiful evidence on the D-day beaches.